Best Cool Mist Humidifier • The Air Geeks, reviews of air conditioners, dehumidifiers and air purifiers. The cool mist humidifier makes it possible to overcome all the problems linked with dry air thanks to its ability to distribute humidified air at the recommended rate and between 40 and 60% of humidity. It is one of the most widely marketed models on the market, as it is a very simple type of humidification. However, it is not perfect because it tends to favour the proliferation of bacteria. We will examine together how to choose your next cold air humidifier so as not to confuse you in your choice. We will also discuss the benefits of choosing an automatic humidifier and a model with an integrated hygrometer. 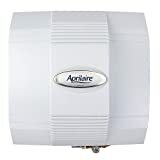 For The Air Geeks, the best cool mist humidifier is the model 700 by the brand Aprilaire. Effectiveness: Humidifies the whole house while still functioning perfectly well with less maintenance cost. Functionality: Works in collaboration with an outdoor thermistor to regulate the indoor temperatures and humidity. Operation: Auto operated without the need for intervention. An excellent model from a very good brand, at an affordable price that will last long. How do cool mist humidifiers work? Cool mist humidifiers consist of a reservoir, wick and a fan as their basic parts. To diffuse moisture into the air, the wick, which also acts as a filter, draws water from the reservoir, while the fan blows air across it. The water is blown off the filter as microscopic droplets. The moisture is evaporated off the filter into the room thereby increasing the humidity. The moisture diffused using this method does not have bacteria and mineral ions and thus is very clean. This is because the impurities are trapped in the filter and only the water particles get to leave the filter. Do cool mist humidifiers help with allergies? 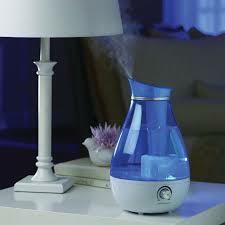 Cool mist humidifiers can be very vital in relieving allergen related illnesses. When moistened air passes through the nasal tissues, it helps to reduce inflammations and congestions and thus the tissues are able to quell allergy attacks more effectively. People with sensitive skin and eczema may also see their conditions become worse if they are exposed to dry air for a long time. This is why maintaining a stable level of humidity is crucial for you and your family. Maintaining allergies such as chronic sinusitis goes down to reducing the number of sinus flare-ups and cool mist humidifiers are very good at helping with this. Are cool mist humidifiers good for babies? Most health experts recommend parents of new-born babies to acquire a humidifier. Small noses are likely to be affected by dry air, causing coughs and congestions. This is because the soft skin in the child’s nose is easily cracked when it breathes dry air creating good areas for viruses and bacteria to infect. Cool mist humidifiers are also safer as compared to their warm counterparts as they don’t pose any danger to babies in case of water spillage while they are playing with them. Where to place a cold mist humidifier? Where you place your humidifier determines how effective it will be in keeping your indoor environment humidified. An ideal location would be flat, firm and about five inches away from walls or furniture. This ensures proper air circulation around the appliance and makes sure objects do not block air openings. As for babies’ room, make sure the humidifier is out of reach by placing it about 3 feet from the crib. This will ensure they don’t tip it over as they try to play with it. When to clean a cold mist humidifier? Because of the way these humidifier work, it means they are capable of working even with tap water. This means the mineral deposits build up more on the filter more quickly. This calls for regular cleaning. Three tablespoonfuls of hydrogen peroxide, which is available at your local pharmacy store, should be enough to do a decent job on the filter. It is also important to disassemble the appliance occasionally and clean the parts with some vinegar and a clean cloth to ensure you get rid of the mold and any bacteria from the tank.